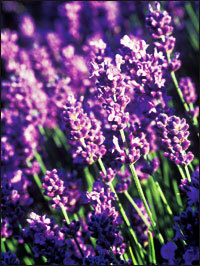 The lavender variety known as “Fashionably Late” blooms a month after other lavenders, from August through September. Other late-blooming plants can be seen in the colorful gardens and greenhouses at the Log House Plants wholesale nursery, near Cottage Grove. Where do plants come from? We buy them and enjoy them with cavalier abandon, but do we ever stop to contemplate the work it takes to get them from their origins to our gardens? One important source is Log House Plants, started in 1974 by Alice Doyle and her partner Greg Lee. Their wholesale nursery, just outside Cottage Grove, produces many of the plants distributed to and sold by retailers in the Northwest. Each time I visit, I’m amazed by the number of plants Log House grows that I’ve never heard of before. This August is my third visit, and I’m just as bowled over as ever. Doyle – a tall, slender woman with thick, curly hair, wearing a flowing cotton dress and sandals – greets me and my road-trip buddy Marian Kuch warmly. She offers us croissants, but we’ve just stoked up on a trucker’s breakfast in preparation for this big plant expedition. Bounding with energy, Doyle leads us on a whirlwind tour of the nursery. Her relaxed black poodle, Charlie, accompanies us, sometimes stopping to nap in the shade while we explore plant tables and greenhouses. Twenty-six greenhouses sit on a hillside, staffed by up to 45 employees in spring, fewer now in late summer. Workers are hand-watering and grooming the pots, and Doyle takes time to introduce each person and compliment them. Even in August, color is everywhere. Red flowering maples (Abutilon “Voodoo”) and coleus in shades of gold, wine and green overflow generous bowls – these make exuberant splashes of color to keep a gardener happy through autumn. We stop to admire unusual annuals, sure to perk up the late-summer garden – vining “Sunspots” morning glory, loaded with tiny orange trumpets, and “Riverdene Gold” cigar plant, with golden leaves and profuse purple flowers. “The joy I have is in the hunt,” Doyle says. In Holland, she found a gherkin that you can eat right off the vine. She offers us a taste of “Mexican Sour Gherkin” – it’s pleasantly tart, with no pickling required. The plant started the Believe It or Not vegetable project, which includes a variegated tomato and an asparagus pea. Doyle shows us a selection of ornamental cucumbers, quirky little spiny and spiky fruit in assorted shapes – long, round and egg-shaped. You can use them in dried flower arrangements or in a bowl along with decorative gourds. She discovered beautifully ruffled gray “Curly Sage” in Crete. Near Pakistan she found a variety of cilantro that she recommends trying instead of basil for making pesto. In India, she came upon Tagetes minuta, a marigold that grows six feet tall, with feathery foliage and a lemony scent. It blooms from mid-September to November, its pale yellow and white flowers resembling statice. She also brought back a cornflower (Centaurea imperialis) with a chocolate aroma. We make a short detour to visit the actual log house where employees are gathering for lunch. Tantalizing aromas fill the air. In the office tons of books line the walls, and Doyle mentions a favorite treasure, “The Vegetable Garden: Illustrations, Descriptions and Culture of the Garden Vegetables of Cold and Temperate Climates,” written by two women back in 1885 in London. Tables are covered with plant labels, plant lists and educational posters that Log House Plants distributes to retail nurseries. One handout provides eight pesto recipes, using basil, sage, cilantro and capers. Returning to the greenhouses, we check out ornamental peppers, good for filling gaps where vegetables have been harvested. “Black Pearl” flaunts dark foliage and red peppers; “Masquerade” has green leaves and purple fruit; “Explosive Ember” is a blend of red and yellow peppers against dark leaves. Doyle also grows stevia, an annual herb that sweetens without the calories or adverse effects of sugar. She advises snipping off the stem tips to keep the plant stocky. You can put these tip cuts on a plate and store them somewhere dark and dry for about a week. Then crumble the leaves off the stems, put them in a bowl, pour boiling water over them and let them steep. Strain the liquid through a coffee filter, and refrigerate the syrup to use as a sweetener. To learn more about Log House Plants’ unusual and useful offerings, find retail outlets and read about Doyle’s adventures with plants, visit its Web site, www.loghouseplants.com.